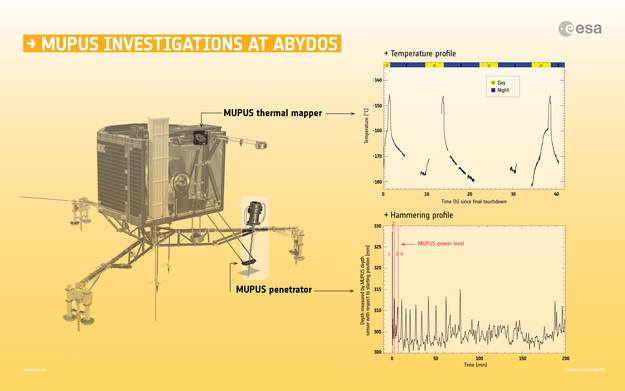 Summary of Philae's MUPUS measurements at Abydos, its final landing site on Comet 67P/Churyumov-Gerasimenko. The graph at top shows the average surface temperature profile measured by the MUPUS thermal mapper, situated on the lander's 'balcony'. Gaps correspond to times when the instrument was not recording data. The profile shows a clear rise and fall in temperature, corresponding to lows of about -180°C and 'highs' of about -140°C in sync with the comet's 12.4 hour day. The peaks are interpreted as infrared radiation from the directly insolated surface, with the more gentle variations outside of the peaks attributed to indirect lighting. The thermal inertia implied by the measured rapid rise and fall in the temperature suggest that the surface consists of a thin layer of dust atop a compacted dust-ice crust. The graph at the bottom shows the hammering profile of the MUPUS penetrator. The displacement is expressed as the position of the depth sensor with respect to its starting position above the surface. An initial displacement of about 27 mm, perhaps through a thin layer of dust, is observed, followed by oscillations of 10–15 mm and smaller displacements. The reason for the lower amplitude after 80 minutes is unclear, but could indicate that the tip of the penetrator had locked to the ground. The data suggest that the instrument was hammering more or less on the spot, although not necessarily at exactly the same spot each time, with indentations of a few millimetres and recoils of up to 10 mm. The red lines indicate the power levels of MUPUS, which correspond to 0.49, 1.59, 2.17 and 4.23 joules, respectively. Discussion is ongoing as to whether the data reflect the full use of energy level 4. In any case, the results provide an estimate of the strength of the surface beneath the thin dust layer as at least 2 MPa.